Register a business opportunity and receive a bonus! Do you have a new business opportunity? Register it and receive a bonus from F-Secure. For every accepted business opportunity registration F-Secure rewards you with a bonus of €250 or €350, depending on the size of the opportunity. Fill in this form. Password: ORB-BE. Together with F-Secure, deltalink will evaluate the opportunity. 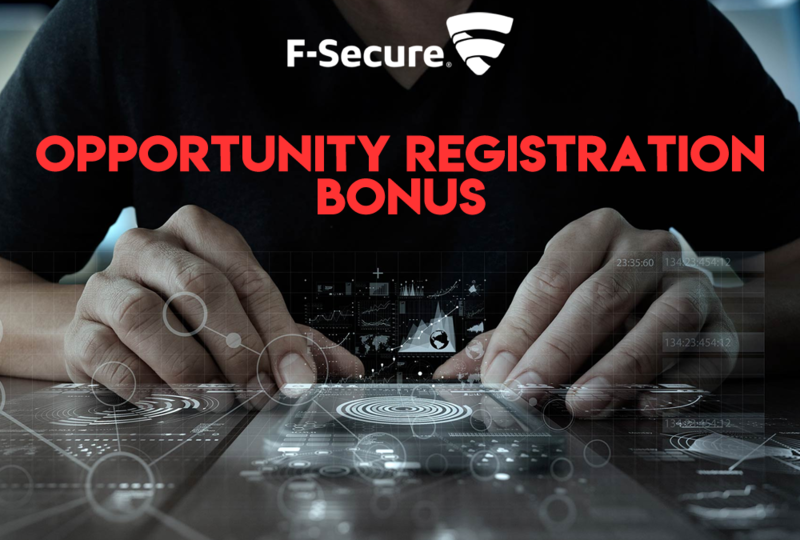 If the opportunity meets the following conditions, F-Secure will reward you with a bonus. interested in a sales action from F-Secure like (online) demo, meeting, pricing information etc. and there is a point of improvement compared to his/her current security vendor. PM: all F-Secure products that contain Policy Manager. PSB: all products in the product line Protection Service for Business. Only opportunities with an interest to buy licenses for a minimum of 1 (one) year. Only new lisenses, no renewals. It’s not possible to register an opportunity after the products have been delivered / deal has been closed. It’s not possible to claim ORB when the opportunity hasn’t been registered through the web form – thus when there is no notification for registration as proof (automatically send to reseller, Deltalink and F-Secure after submitting form). It’s not possible to register an opportunity when this opportunity has already been claimed by another reseller. Will help the end customer to understand the benefits and features of F-Secure solutions. Will investigate what the challenges of the end customer are on security level and will show the end customer how F-Secure solutions can help him/her solving these challenges. Will be delivering sales activities like demo’s, presentations, proof of concepts etc. to the end customer. In case needed, the reseller will ask F-Secure and/or Deltalink for help with the previous mentioned issues in order to close the deal. Identify new sales opportunities for F-Secure solutions with new and existing b2b end customers. Positive towards contact with an F-Secure account manager in order to define a partner status, to investigate the potential business and to think about a mutual agreed plan how to grow the F-Secure business. Participated in the mandatory F-Secure reseller trainings to be able to become a F-Secure reseller. F-Secure may at all times change the ORB program without notifying (potential) participants, without reason and without mutual agreement between all parties involved. If there are sufficient arguments, F-Secure and Deltalink always have the right not to pay the bonus or to cancel it. F-Secure generated leads may not be registered in the ORB program. Leads generated by Deltalink may not be registered in the ORB progam, unless specifically approved by F-Secure. Only F-Secure can determine if a registration is qualified enough for payment.